Rabat - Tap, tap, crack. Tap, tap, crack. The sound of argan nuts being split open between smooth river stones continues in a repetitive beat. Tap, tap, crack. Three barefoot Berber women are propped up with cushions, sitting cross-legged, as they go through the motions. 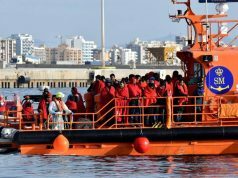 Gemima Harvey is a freelance journalist and photographer focusing on social justice issues, legacies of war and the environment. 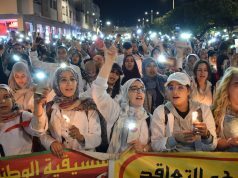 Rabat – Tap, tap, crack. Tap, tap, crack. The sound of argan nuts being split open between smooth river stones continues in a repetitive beat. Tap, tap, crack. Three barefoot Berber women are propped up with cushions, sitting cross-legged, as they go through the motions. Beside them are baskets brimming with argan pieces — the fruit casings, discarded shells and prized kernels — picked from the ‘Tree of Life’, a spiny evergreen, endemic to southwest Morocco. On the stretch of road between Essaouira and Marrakech, prickly-leaved argan trees span out to the horizon in every direction, thriving in the arid climate where few other plants could prosper. Herds of goats climb the gnarled trunks, staring out from the canopy between indulgent mouthfuls of plum-sized argan fruits. A camel cranes its neck to secure a bite. 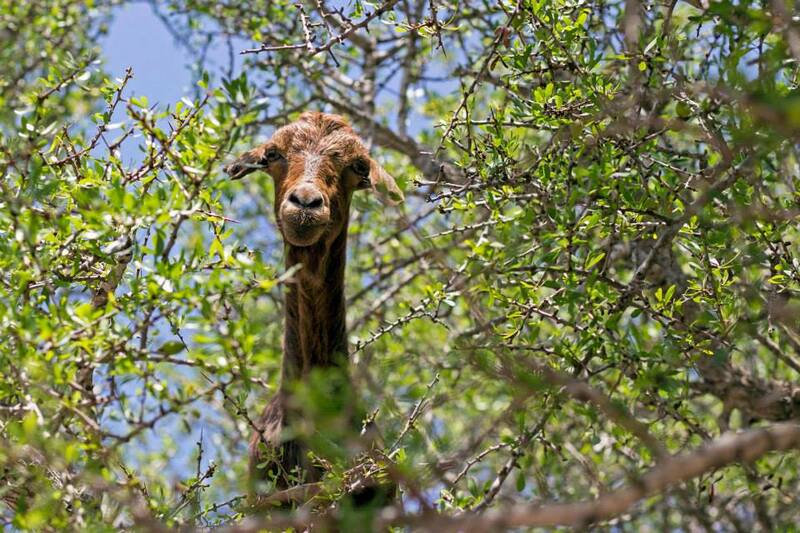 A goat stares out from the canopy of an argan tree between mouthfuls of fruit. The peel and pulpy flesh are a favourite treat for animals but the kernels are cherished for another reason: their oil. Argan oil is so versatile and valuable it’s likened to ‘liquid gold’. With a wide-platform of uses, both culinary and cosmetic, and long list of medicinal properties, the oil is an attractive commodity and the rest of the world is catching on to its healing benefits. Exports more than doubled in the last 5 years to 700 tons, Bloomberg reported in 2013, adding that growing demand had bumped up wholesale prices 50 percent since 2007, to $30 a litre. Retail prices can exceed 10 times that amount. A Berber women patiently goes through the motions of cracking argan nuts to retrieve the kernels. Argan (Argania spinosa) is an endangered species that plays a vital role in resisting the ever-creeping Sahara Desert. 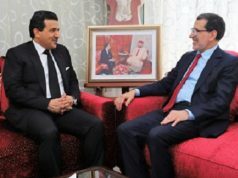 The trees are also found in Algeria and have been successfully introduced to Israel but Morocco is the only nation that hosts a meaningful scale. Morocco’s argan forests cover about 800,000 hectares near the Souss Valley, an area framed by the Atlas Mountains, Atlantic Ocean and Sahara Desert, which hosts roughly 21 million trees and has been given UNESCO protection as a ‘biosphere reserve’. Argan husks are reportedly 16 times tougher than a hazelnut shell. 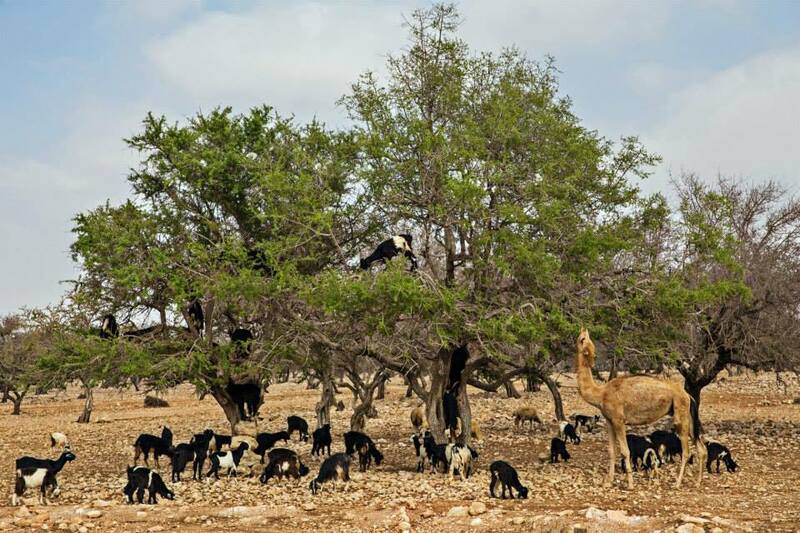 Stories, dating back to the 13th century, explain that goats would eat the argan fruits, locals later collecting their droppings to retrieve the argan nuts, which had been conveniently softened by the animals’ stomach juices. This method saved on labour by making the kernels easier to salvage, but the resulting oil had a distinct stink to it. Today, argan oil production skips the goats’ intestines. The work is done with the hands of tireless women. Argan nuts must be cracked manually — attempts to mechanise the method have failed to keep the delicate kernels in tact. 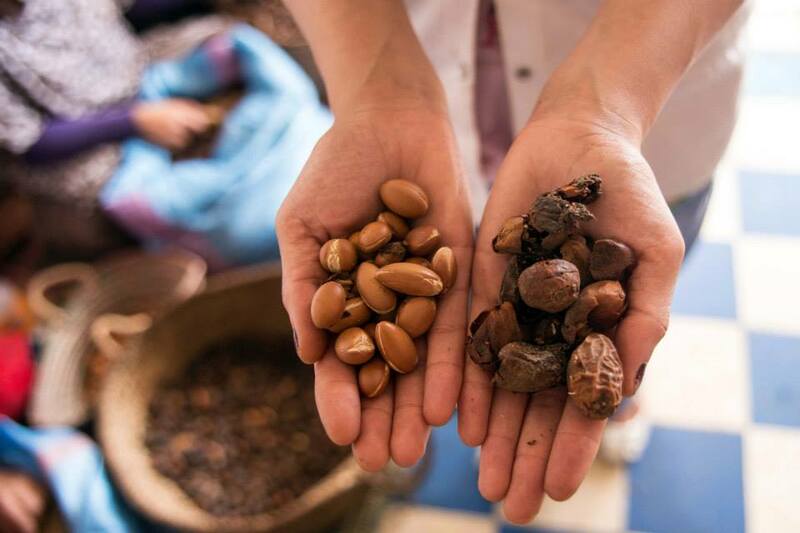 It takes 30kg ­of argan nuts, roughly the annual yield of one tree, and between 15 and 20 hours of hand processing to make 2 litres of cooking oil or 1 litre of cosmetic oil. The process of splitting the nuts to retrieve the oil-rich seeds is highly labour intensive and this, coupled with the rarity of the argan tree, explains why argan oil is the most expensive edible oil in the world. 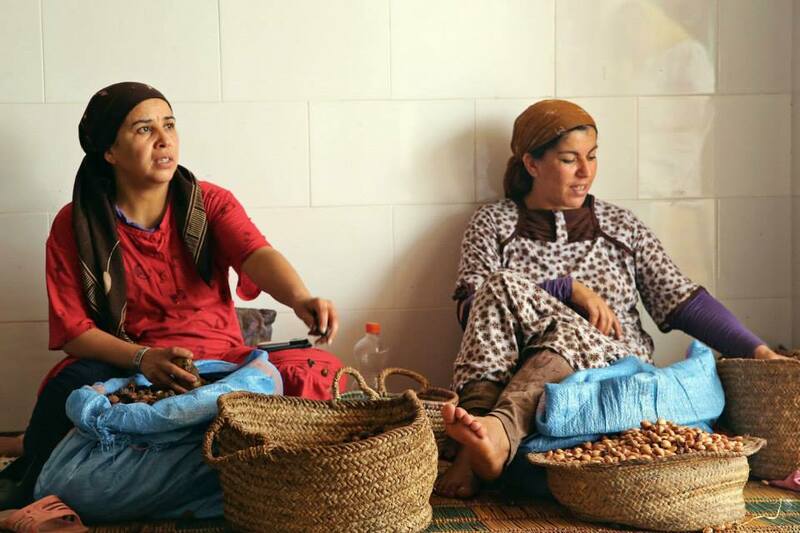 Workers at Assaisse Ouzeka chat while cracking argan nuts. According to the International Development Research Centre (IDRC), argan trees support the livelihoods of 3 million Moroccans, about 10% of the country’s population, who use the husks as firewood, the fruit for animal fodder and the pips to make precious oil. Argan oil is an important economy for locals — particularly for women, who have grouped together to form more than 150 cooperatives. 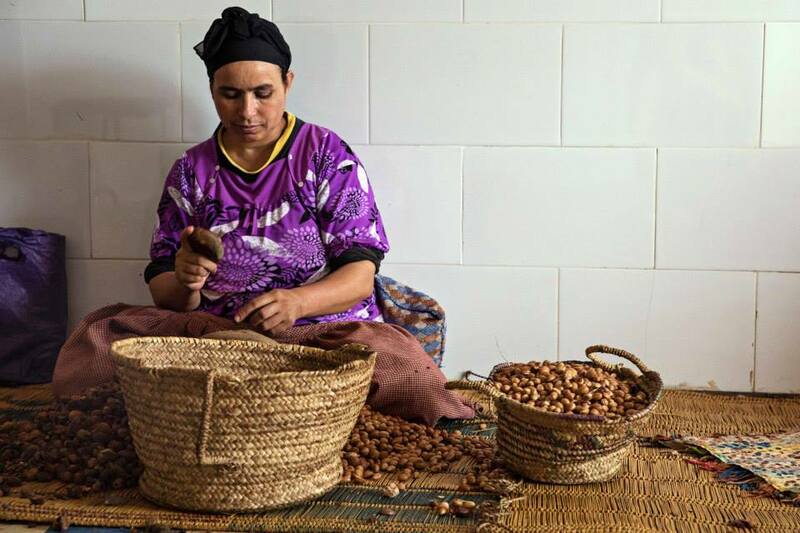 Chemistry professor and founder of Morocco’s first female-run argan collective, Zoubida Charrouf, told the IDRC that the women’s incomes have increased to about €6 a day, 10 times more than a few years ago. Tourists are welcome to visit the centres, to learn about the process of making argan oil and to purchase a pot of face cream, scented body oil or even some argan flower honey. Laila Kanzi holds up a handful of argan nuts and a handful of dried fruit casings. Stopping a short drive from Essaouira, at Assaisse Ouzeka, a certified organic cooperative that employs about 30 women, I’m greeted by Ms. Laila Kanzi, who walks me through the steps of making argan oil. Dipping freshly made bread into a paste of argan oil, honey and crushed sweet almonds is a favourite breakfast for locals. It’s called ‘Amlou’ and is like ‘Moroccan peanut butter,’ Ms Kanzi says. To produce cooking oil, the argan kernels are roasted, making the oil easier to extract and enhancing the nutty-taste, next they are ground in a traditional hand mill, warm water is added to the paste, which is then hand-squeezed to separate the oil and the leftover protein cakes are fed to animals. ‘Chocolate for cows,’ Ms. Kanzi announces with a smile. For the cosmetic oil, kernels are kept fresh. This means the yield is less than cooking oil extraction but ensures the healing properties are not destroyed by heat and that an overly nutty smell is avoided. The level of mechanical assistance varies between cooperatives. Searching through bottles on shelves at Assaisse Ouzeka, I see products used in Moroccan beauty rituals since antiquity, like Savon Noir, the black soap used as a traditional scrub at hammams and Rassouline, a mix of volcanic stones and argan oil infused with rose or orange blossom. The Moroccan secret is out. Argan oil is now being sold around the world, and it’s not just a niche market for boutique and online brands either, big names like Unilever and L’Oréal are using the ‘miracle’ ingredient in hair care ranges.